Burgoyne Diller was born in the Bronx in 1906, he grew up in Buffalo, New York and later moved to Battle Creek, Michigan. In 1925 Diller started school at Michigan State College, but left after only two years. Due to the great economic period of decline, jobs were scarce and money was tight. 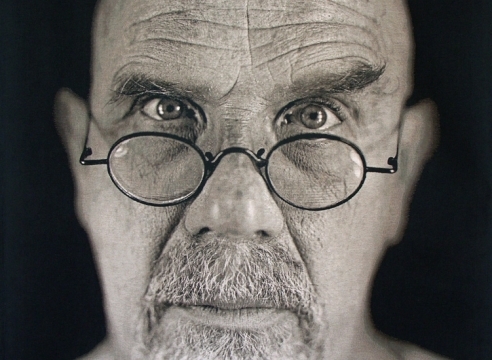 Diller struggled to find sufficient work in Michigan. So in 1928, Diller moved back to New York, where he was awarded a scholarship to enroll in the Art Students League. At the Art Students League, Diller discovered inspiration in the Russian Constructivist work of Kazimir Malevich (1878-1935) and other artists, and the work of the De Stijl artists Piet Mondrian (1872-1944) and Theo van Doesburg (1883-1931). Diller also was greatly influenced by teachers Hans Hofmann (1880-1966) and Jan Matulka (1890-1972), who both encouraged Diller’s exploration of pure color and form. As a student Diller demonstrated leadership qualities, often coordinating exhibitions at the Art Students League. In 1933 he organized a show of avant-guard student work exhibiting, for the first time, a group of emerging, post-war American Cubists. In the Early 1930’s Diller began making Geometric art. It was during that time that his artistic style transformed from cubism to non-objective neoplasticism. And in 1933, Burgoyne Diller mounted a solo exhibition at Contemporary Arts Museum in New York City. The introduction for the catalogue was written by Hans Hofmann, whom Diller greatly admired. Upon graduating from the Art Students League in 1934, he began working for the Public Works of Art Project (PWAP) and then the Temporary Emergency Relief Administration (TERA), as a muralist and easel painter. Both of these committees were setup in the New York City area; their aim was to provide much needed employment to artists. In addition, Diller founded the artist group called “Group A” in 1934. A year later, Diller was appointed director of the New York City PWPA Mural Division. During a time of national economic turmoil when jobs were few and far between, Diller found work for hundreds of artists. Many of the artists employed by Diller later became some of the most important early 20-century names such as Arshile Gorky (1904-1948) and Stuart Davis (1894-1964). As director he supervised the execution of over 200 public murals. As a fervent advocate for Abstract Art, Diller became a founding member of the American Abstract Artists group on March 12, 1936. The American Abstract Artist group held their first exhibition at the Squibb Galleries, less than a month after Diller was initiated. In 1937, Burgoyne Diller became sole administrator of the PWPA's mural division, putting him in charge of mural programs for public schools, colleges, libraries, municipal buildings, and hospitals. Despite increased responsibility at work, Diller continued to work diligently at his own art, even broadening his body of work. It was during this time that Diller began to make relief sculptures, combining flat painted grounds and projecting elements in low relief. Diller worked diligently for the PWPA until the outbreak of World War II, when he served time in the Navy. After his time in the Navy, Burgoyne became a professor at Brooklyn College in 1946. The roles of student and teacher were now reversed for Diller, and he received the chance to teach and inspire an entire generation of abstract artists. Decades of heavy drinking had taken their toll on Diller, and he died on January 30,th 1965 in New York. Diller will always be remembered as a one of the most significant artists devoted to geometric abstraction, and a true pioneer of American modernism. Respected by his peers and admired by his pupils, Burgoyne Diller’s acclaim should be attributed not only to the strength of his character but also to the significance of his work. Diller’s simplified, nonobjective images subsist as both a legacy and the connecting tie between earlier and later methods of abstraction explored by twentieth-century American artists. Developing his own hard-edged geometric style, Diller drew upon the influences of Dutch De Stjil and Russian Constructivism. He was one the first Americans to adopt the principles of Neo-Plasticism. Diller’s work can be broken up into three visual themes, all of which explore the range of placements of geometric forms. Always meticulous, Diller made collages in preparation for his carefully planned paintings. In his collages, Diller would move paper cutouts around and around, trying to sort out the exact placement of each piece in order to create a perfect equilibrium. These collages serve essentially as models for Diller’s paintings and later models for his austere formica sculptures which are extensions of his painting style. Composed predominantly of squares and rectangles and accented with primary colors against a solid white background, Diller’s mature abstract paintings are the results of his explorations of pure color and form. Diller’s austere work recalls the stinging isolation of the lives of all Americans of the Depression era, and possibly his own. However, the well-planned geometric nature of his paintings, reveals his desire for a new reconstructed world prevailing over the seemingly hopeless situation in the United States during the Depression. 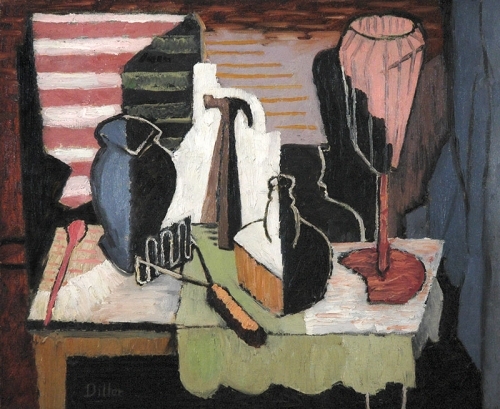 Not only did Diller play an influential role in the development of American abstract art in the 1930s, he also exhibited his work internationally and received critical acclaim. Today, Diller’s progressive and unique oeuvre of paintings, drawings, collages, and sculptures is recognized as a key influence on American Minimalism of the 1960s and 1970s. 1962 Begins making free-standing sculpture, which he dubbed "color structures"; The sculptures are vertical totems composed of wooden forms painted red, yellow, blue, black, gray, and white. 1965 Dies on January 30th in New York, NY. 6. Karmel, Pepe. “Art in Review,” New York Times, May 12, 1995, Arts Section. 1963 The Corcoran Gallery, Washington, D.C.